Fans of USA cheer during an international friendly match against France in the SheBelieves Cup at Nissan Stadium on March 6, 2016 in Nashville, Tennessee. Lake Effect's Audrey Nowakowski with sports contributor Shaun Ranft, writer and managing editor of The Sports Post. Equal payment has also become a fight that members of US women’s national soccer team have now officially taken to court. Five players on the team – including stars Hope Solo, Carli Lloyd and Alex Morgan – have filed a wage-discrimination action against the US Soccer Federation with the Equal Employment Opportunity Commission. 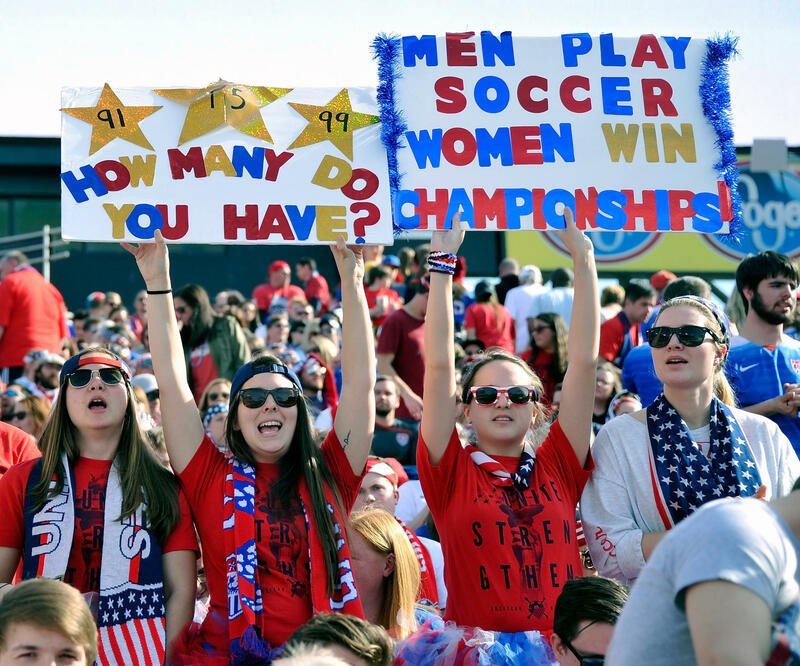 According to ESPN reports, the action against the USSF cites figures from the 2015 financial reports - noting that despite generating nearly $20 million dollars more revenue than the men’s team, the women are paid about a quarter of what the men earn. The women’s national soccer team has been tremendously successful in recent years, winning the 2015 Women’s World Cup, the most watched soccer game in US history. Yet, the team only received $2 million for that finish, compared to the men’s team, which brought in $9 million for finishing in 11th place. While Title IX was a big step forward, there are many other persistent issues for women in sports – from viewership and ticket sales to sponsorship deals - that leads many to wonder what the remedy might be. However sports contributor Shaun Ranft believes that the revenue argument does not hold any significant ground because the cycles are too similar for both the male and female teams. "It's always going to be higher in every cycle for each gender in the World Cup years, that's just how it works," explains Ranft. "You can't just use that as a convenient way to say they don't deserve more now because they're only playing in a world cup...that's not a good argument to make...I don't care who generates more revenue there, you can't tell me that there isn't a few extra thousand dollars from US Soccer to kick out to the players for that - you just can't." Outside of women's soccer, similar incidents of unequal pay and sexist scrutiny are far too common in all professional sports. Andy Benoit from Sports Illustrated tweeted that all women’s sports are “not worth watching." Sports television personality Stephen A. Smith said that some of these athletes hold themselves back because they “might not have wanted to mess their hair up." These examples show the uphill battle female professional athletes face. "(Women) are told day in and day out that they don't have a place here, that nobody cares, that if you're not pretty it doesn't matter, and the men don't have to deal with that," says Ranft. Jessica Mendoza of ESPN is the first female baseball commentator. Recently ESPN's first female baseball announcer Jessica Mendoza came under fire from not only the public, but fellow sports commentators as well, who were claiming she was unqualified to do the job, despite Mendoza being a member of two Olympic medal-winning softball teams. Her position has garnered her complaints, death threats and many other forms of sexism. But can the playing field be evened in professional sports by simply offering fairer compensation? Would it create more viewership and more revenue? Ranft still thinks that it would be a far too optimistic view. "In a perfect world (women's sports) would probably be almost as interesting because still people would at the end of the day say 'I don't care, they're just women playing sports,'" he says. 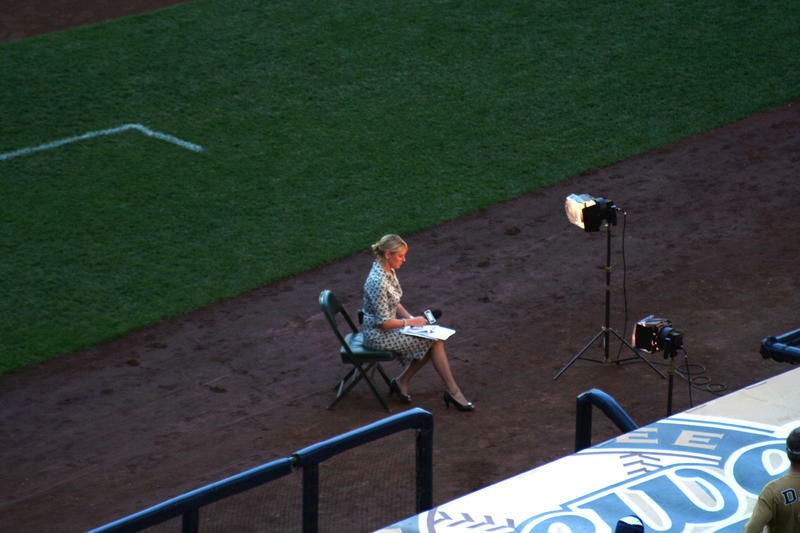 As a sports writer, Ranft has personally seen and experienced the "ruthless aggression and sexism" other female sports writers encounter everyday. At times he is targeted by other men for simply defending other women online with accusations of ulterior motives. "Sorry guys, as a guy also, we don't get to...tell someone what they can and cannot be offended by. Especially when for women in sports, in general, for years has had to deal with this kind of ruthless aggression and sexism," says Ranft. "And it's not getting any better. It's getting better that more people are calling it out...but it's not getting any better. If anything people are just getting louder now because they're getting some pushback, finally." With so many incidents against women in sports, from monetary discrimination to negative publicity, Ranft encourages vigilance from both sexes to bringing attention to those who make negative comments against women. "Next time you say something stupid, or sexist, or slightly insensitive, just think - is that how you would like your mother, your grandmother, maybe your daughter, or even your sister to be treated? There's only one correct answer there," he says. Soccer bars in town may be crowded Tuesday evening, to watch the U. S. meet Germany in the semi-finals of Women’s World Cup. Germany is the top-ranked team. 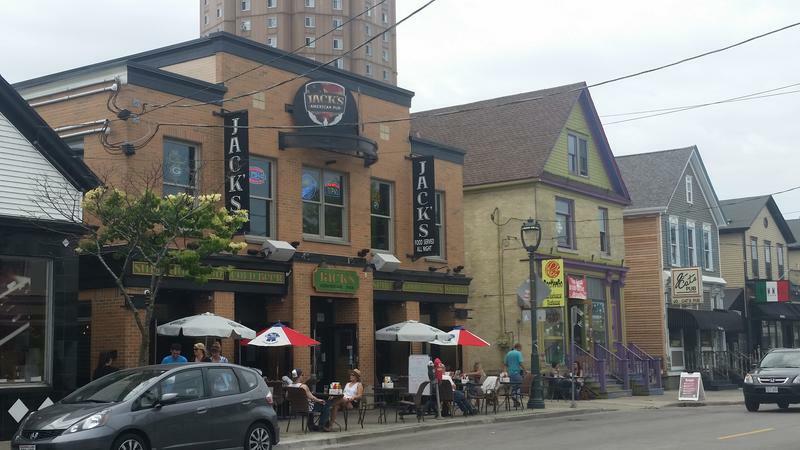 Peter Marshall, owner of Jack’s American Pub on Brady Street, is expecting plenty of customers but admits soccer fans are more passionate in his native Manchester.